I wrote previously about Al's Diner, the story of an outlaw cook in Rio Dell a decade ago. The term "Outlaw Cook" I stole from the eponymous book by John Thorne, in which he goes against the grain of all the "rules" of the culinary establishment, with chapter headings like "The Discovery of Slowness" and "Learning To Eat." (His website, home of his magazine Simple Cooking, is www.outlawcook.com.) These are, of course, different interpretations of "outlaw" -- Thorne's is "against the rules"; Al's was "against the law." I like both. 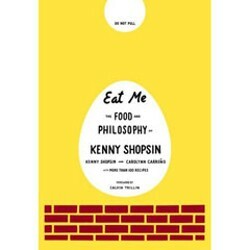 Now comes Kenny Shopsin and his new cookbook/memoir Eat Me. Actually, Shopsin's has been around for decades, a Greenwich Village place with a six-page menu, jammed with 1,000 original creations like "The Goyboy Sandwich" (pulled beef, fried onions, cheddar, vichyssoise sauce), "Macaroni and cheese pancakes" or "White trash chicken hash with eggs." But there's another element to "outlaw cooks" besides their eccentricity: They all seem to have evolved through paths not common to the culinary profession. Anthony Bourdain (Kitchen Confidential, No Reservations) went to culinary school, and his cookbooks use classic methodologies -- he's an iconoclast, but not an outlaw. Al, John and Kenny are. Al is a blue-collar cook who learned from working the line at countless greasy spoons: His secrets are those of the grill and the deep fryer. John is self-taught, but is an educated cook and polymath. Kenny learned everything he knows from trial and error in his own little neighborhood grocery: He has sometimes invented the wheel from scratch; surprisingly often, it's a better wheel. An autodidact is more open to outrageous possibilities, like Pecan Chicken Wild Rice Cream Enchiladas, Chocolate Peanut-butter S'mores French Toast and Cheeseburger & Fries soup. Many dishes have personalized names, like Slutty Cakes, Blisters On My Sister's, Squaw Eggs, Eggs Piaf, Jewboy Sandwiches I, II, and III, and Greekboy Sandwich (brisket, tapenade, crisp mushrooms, feta, tahini). He is scrupulously politically incorrect: There's also a Jihadboy Sandwich. Another outlaw touch: His is the only restaurant I've ever heard of that makes soup to order. And while he seems to revere only the original James Beard Cookbook (a reverence I share), similarities to classic cooking practice can be found: for example, a spice mixture of cinnamon, clove, ginger, nutmeg and allspice that is reminiscent of both Chinese "Five Spices" and a Julia Child spice rub for pork. Keep a mix of salt and pepper in one container. Mine is a ratio of 80 percent salt to 20 percent pepper. Usually if I'm adding salt to something, I'm adding pepper too. And this way I only have to pick up one container ... It is not salt now, and it is not pepper; it's saltandpepper. 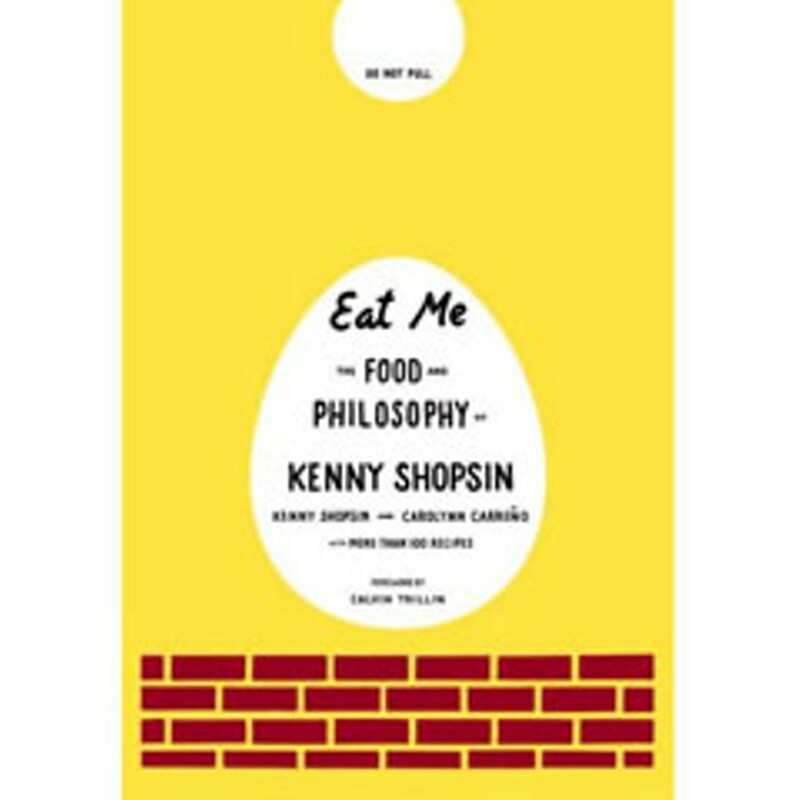 But more than philosophy, this book offers secrets to simple cooking, using mostly easily-found ingredients in bright new imaginative combinations. Prepare the griddle and drop the pancake batter according to the instructions. When small bubbles appear on 40 to 50 percent of the surface of the pancakes, about 2 minutes, drop about 1 tablespoon of the warm elbow macaroni on each pancake. Sprinkle with a thin layer of cheese (about 1 tablespoon) and use a thin, lightweight spatula to rapidly flip the pancakes. After all the pancakes have been turned, reduce the heat to medium and use the spatula to press the pancakes down on the griddle. When the undersides are golden, about 2 minutes after turning them, use the spatula in a decisive high-pressure sawing motion to lift and turn the pancakes onto a plate, B-side up. Serve fanned out on a plate like a hand of cards so you can butter each one without lifting it. Serve with butter and warm maple syrup. P.S. There is a 2004 DVD documentary about Shopsin's, I Like Killing Flies, a film we enjoyed enormously. In immodest moments, Joseph Byrd considers himself an outlaw cook. E-mail him at eat.your.spinach@gmail.com.